Very little information has previously been available about this interesting machine since it was used throughout the Cold War and well into the 1980s. In addition to the brief material below, You will find hundreds of detailed photographs, descriptions, wiring data tables, and explanations in the links in the following fIALKA MENU. Much higher resolution versions of all the Fialka photographs that would not fit in this CD are available in a separate Fialka CD. 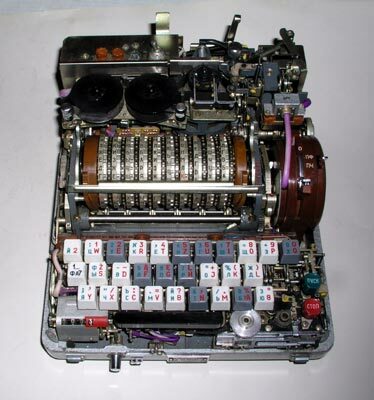 The Fialka is generally similar in design to the German Enigma cipher machine but it has 10 rotors with 30 Russian characters/contacts instead of the 3 or 4 rotors with 26 letters/numbers/contacts in the German WW-2 Enigmas. The first version of the Fialka, the M-100 was produced in the 1930s and it was followed by the M-105 and then the M-125 models described here. The M-125 models include the M-125-MN and the much more complicated M-125-3MN. (M-125-3MP3 and M-125-3MP2 models have also been reported. They appear nearly identical with the M-125-3MN but may have slightly different keyboards.) The codename "FIALKA" is the Russian word for "VIOLET". 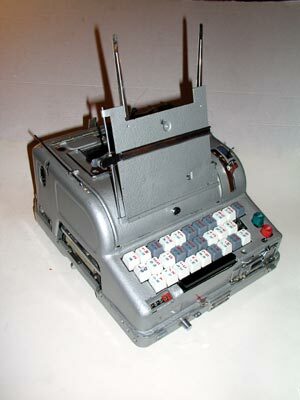 Instead of illuminating light bulbs to display the output characters resulting from inputting characters into the keyboard, the Fialka prints the output characters on paper tape and simultaneously punches holes in the tape in 5 level characters resembling those of a Baudot teletype machine tape. 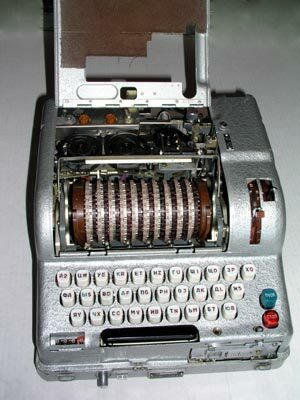 The Fialka also includes a paper tape reader for use in rapidly inputting characters that have been punched into a paper tape. 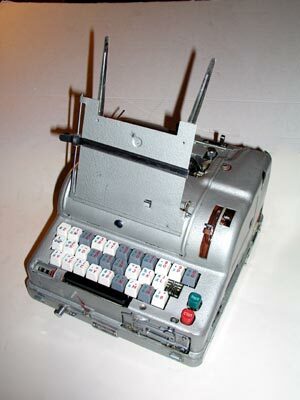 The Fialka incorporates a card reader which allows punched paper cards to be used to set internal coding parameters. These cards replaced the clumsy, difficult-to-set, and therefore error-prone plugboards of the German Enigmas. 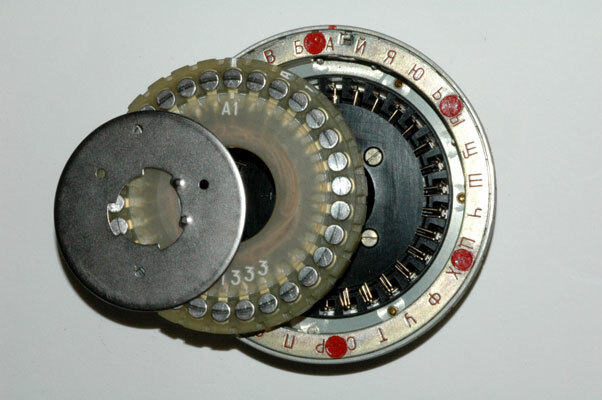 The reflector at the left of the rotor stack is different from the reflector in an Enigma and different in each Fialka model. 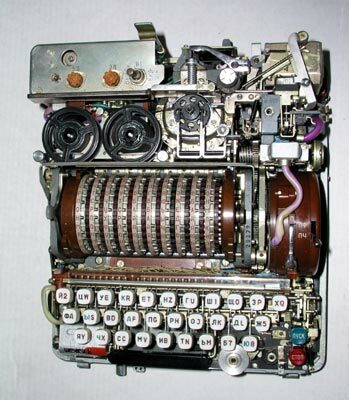 Unlike an Enigma which has a completely self-contained reflector, the reflector in the M-125-MN Fialka has one bundle of wires extending down from it. The reflector in the M-125-3MN / -3MP3 has three bundles of wires coming out of it. 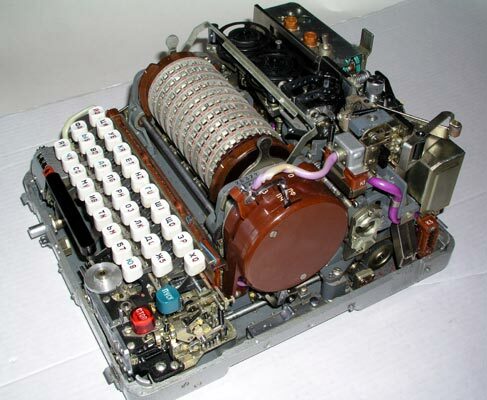 The M-125-3MN and M-125-3MP3 models differ from the M-125-MN models in that they incorporate multi-lingual keyboards and some unique and complex switches that allow the machine to function with several languages. There are two different sets of 10 rotors that can be inserted into either machine. If present, the second set of rotors may be carried in a cylinder inside the cover of the machines. One set is non-adjustable with fixed ring settings and a fixed wiring maze. 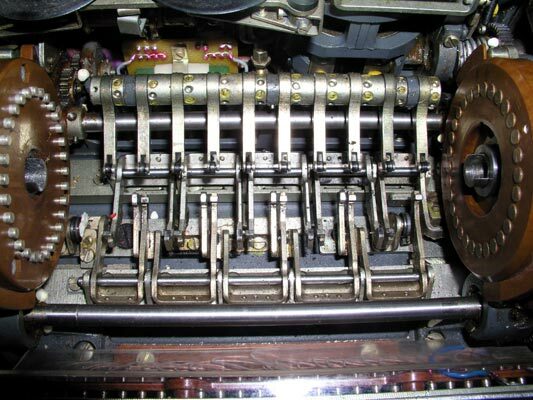 The other set is exceptionally cleverly designed in that it allows for both the normal Enigma-like changes in ring settings (the outer lettered ring may be rotated) coupled with the ability to actually remove the internal wiring maze module from each rotor. 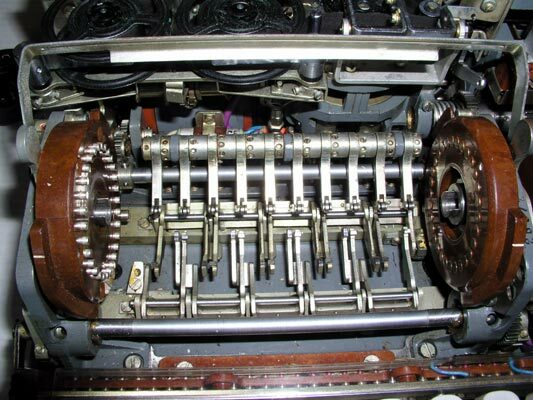 Once the wiring maze is removed, it may be reinserted into the rotor in any of the 30 possible positions and/or flipped upside down and inserted in any of the 30 positions to give a total of 60 unique wiring circuits. In addition, the wiring maze module itself may be removed from the rotor and inserted into a different rotor. 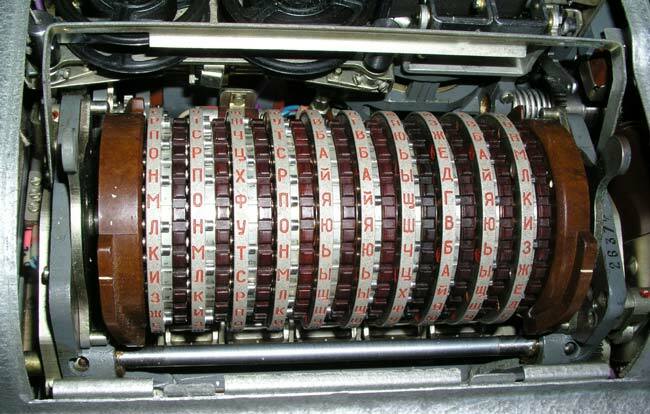 In order to allow the use of the 30 key keyboard and 30 contact rotors, the Russians probably did not use three letters from the 33 letter alphabet. They probably omitted The soft E, usually shown as an E with an umlaut, the reversed letter E which is actually a Greek letter with a short sound that is often found in cognates, and the hard sign which has generally not been used since the revolution. 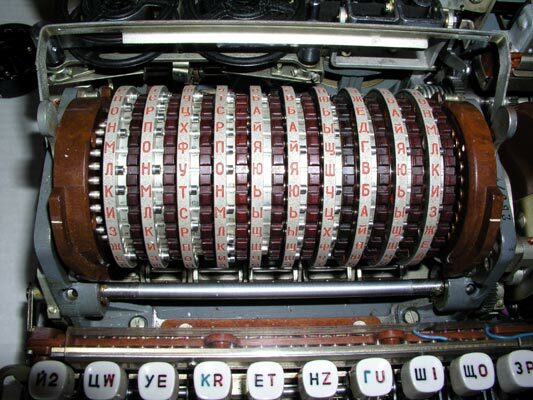 Numbers were apparently represented by the 2, 5, 7, and 8 on the keyboard keys and by other symbols. The Roman numeral 1 or I may have represented 1. The Cyrillic 3 and soft sign may have represented 3 and 6 respectively. 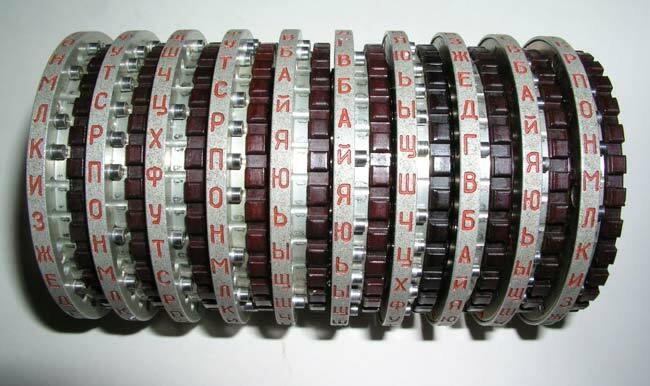 The Cyrillic "ya" may have represented 9 with 10 being represented by the Cyrillic "yu". More information will be added as it becomes available. The following photographs should help to clarify the comments and descriptions above: Hundreds of additional Fialka photographs, descriptions and wiring and rotation data tables are available in the links listed in the menu at the top of this section. Much higher resolution versions of all these Fialka photographs are available on a separate Fialka CD. 170s1k A view of the 10 rotors after opening the cover. The paper tape printer and punch are also visible behind the rotor stack. This model is MUCH more complex than the M-125-MN model. 6. A position on the switch located to the right of the input wheel that stops rotation of the rotors and character counting as characters are typed in. 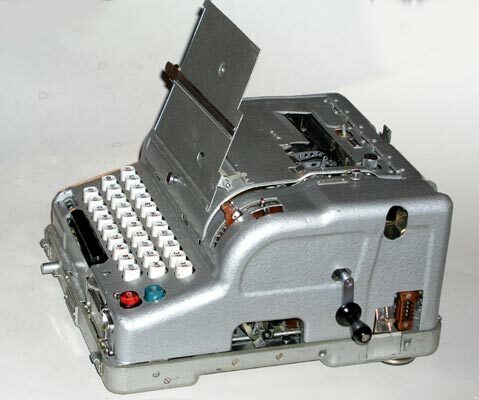 171s1a The left side view of the M-125-3MN Fialka shows the copy holder with its extensions, the character counter, the multilingual keyboard, and the slot on the left side for the paper programming card. 171s1k The carrier for the paper programming card being pulled out of the left side of the Fialka to allow insertion of the card. 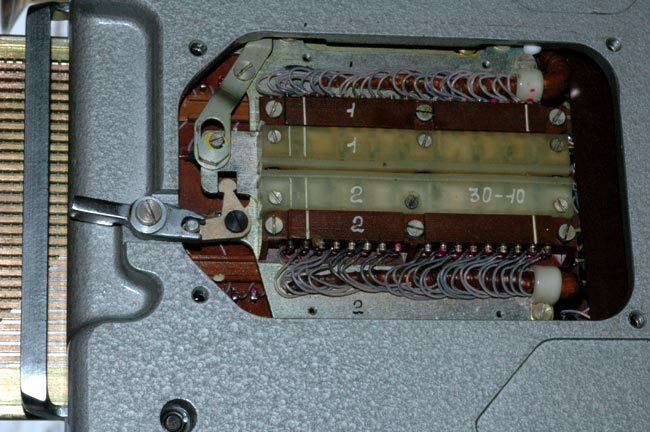 u_171s5i The complicated multi-contact switch located under the punched paper programming card that switches many of its contacts. This switch is not found in the M-125-MN model. 171s1b The Right side of the Fialka showing the copy holder and input wheel levers. 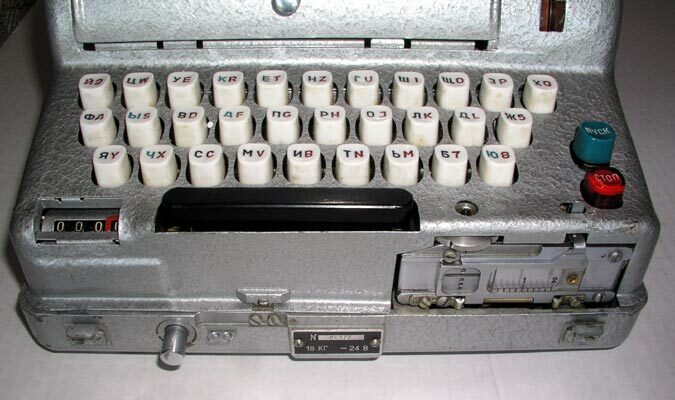 The switches under the keyboard and rotors, and the hole for the hand crank that allows manual operation of the Fialka are just barely visible. u_171s1c The 10 rotors after the cover door is opened. The index bar has been lowered in place in front of the rotors to allow accurate setting. u_171s1w A top view of the Fialka with cover removed (3 screws). The power switch and fuses are in the left rear. 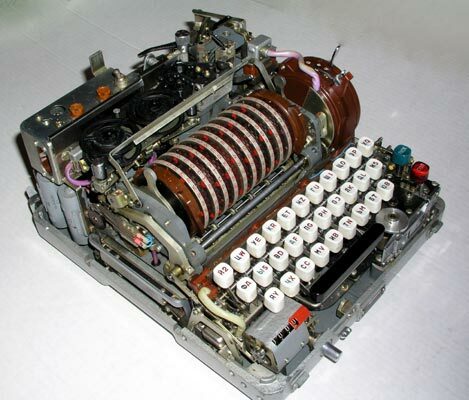 The paper tape printer ribbon reels, the printer and the paper tape punch are behind the 10 rotors. The brown reflector is on the left end of the rotor stack. The input wheel is on the right end of the rotor stack. 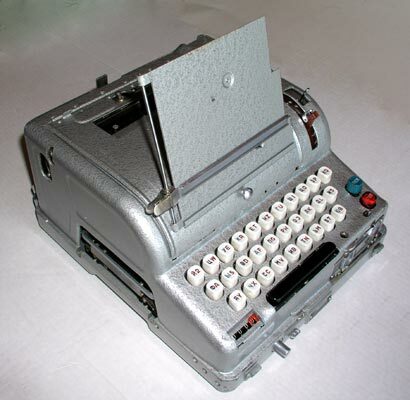 The keyboard and paper tape reader with its manual paper tape feed wheel are in front. u_175s4w A top view of the Fialka showing all 5 of the modular components after disassembly. The Electric Motor is in the top left. 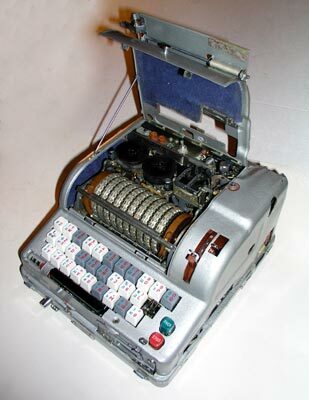 The Paper Tape Punch and Printer is in the top right. The Base Plate is in the middle of the picture. The Rotor Mechanism is below the base plate. 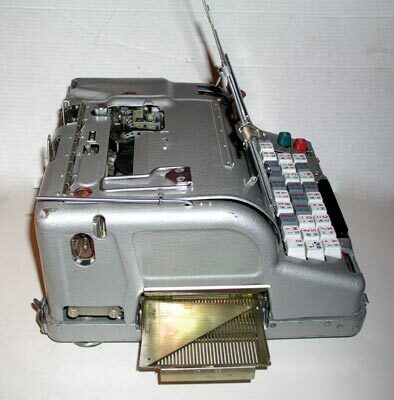 The Keyboard is below the rotor mechanism. u_171s1m A closer view of the 10 rotors with the index bar raised to permit removal of the rotor stack. The two rounded levers that push the reflector on the left and the input wheel on the right inward have been pulled forward so that the reflector and input wheel may be pushed outwards to allow the rotor stack to be removed. These rotors are the Non-Adjustable rotors. The multi-adjustable rotors are described later under accessories and in the special detailed section on rotors and rotor movement. 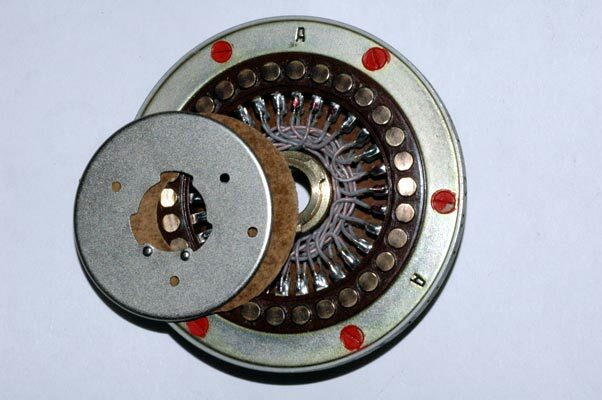 u_171s1y The drive mechanisms that produce the rotation of alternate rotors. u_171s6e The internal hand-wired set of connections between the input contacts and output contacts of this Non-Adjustable rotor is called a wiring maze. 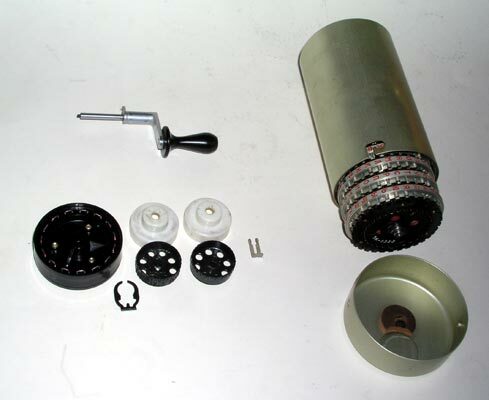 It can be inspected or repaired by removing a metal disc as shown here. The wiring of these non-adjustable rotors is not designed to be changed. u_170s6p The Multi-Adjustable Rotors can have their modular wiring maze removed and reinserted in 60 different ways. Their outer ring setting can also be changed in 30 ways. Details and more pictures are in the links above. u_170s7u The Cover of the Fialka may contain a number of accessories including a set of complex multi-adjustable modular wiring maze rotors, additional print wheels, a special test reflector, and a hand crank. 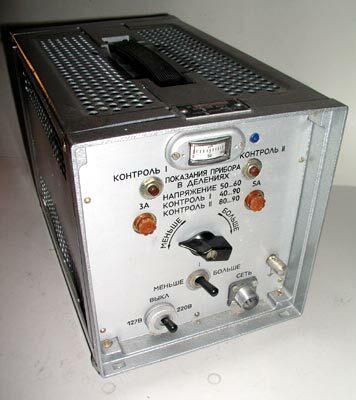 u_170s8a The 24 Volt DC Power Supply. The other sections or links in the above FIALKA MENU describe and display the M-125MN model and the much more complex M-125-3MN / -3MP3 model, the rotor wiring and rotation data, the power supply and cables and the accessories including the multi-adjustable modular wiring maze rotor set.